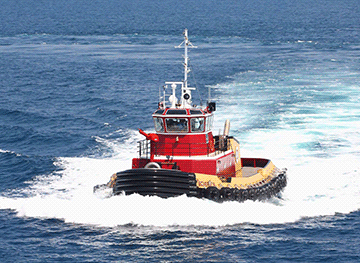 Brown water tugs and other river and inland vessels have their own special noise reduction situations. First, they don’t need to meet as stringent fire control regulations as off-shore vessels. This allows a greater range of materials without sacrificing safety. And with crews often sleeping overnights or multi-day voyages, noise can cause health issues, workplace safety concerns and just generally grumpy crew. Even if your vessel doesn’t include overnights, it will include long hours on board – and amenities must be economical. There are a number of effective measures you can take to reduce structureborne and airborne noise transmission and make your vessel safe and easier to work on. With over 30 years of experience reducing noise on similar vessels, Soundown’s audio experts have created the following list of suggested treatments. Improved areas: Entire vessel. Engine room placement may be different in different vessels. So where engine noise manifests will vary depending on the boat’s architecture. Problem: Engines are generally installed with attention to thrust performance, using hard mounts that make no allowance for noise reduction. Engine mounts. We recommend soft mounts on an engine that’s directly connected to your propulsion. Ideally, if there’s space, your best bet is a remote engine with RD Conical Mounts and highly flexible couplings. Call our experts for specifications based on your vessel – the service is included when you order a noise reduction solution or have your engine more effectively mounted. Improved areas: Entire vessel, with the greatest improvement noticeable in areas closest to the smoke stack or exhaust path. Problem: High powered engines which are often placed with a stack exhaust configuration that channels exhaust – and very high-energy vibration – through the vessel’s center. Solution: Strategic isolation of the exhaust system. To offset the high degree of energy transfer to the hull through exhaust mounts to the accommodations areas, you mathematically generate a combination of hard mounts, flexible mounts and bellows that minimize the amount of vibrational energy getting transferred into the hull. 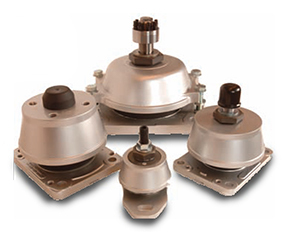 Our experts include specifying the most effective distances and mounting points for your configuration as part of the exhaust isolation service Soundown provides. 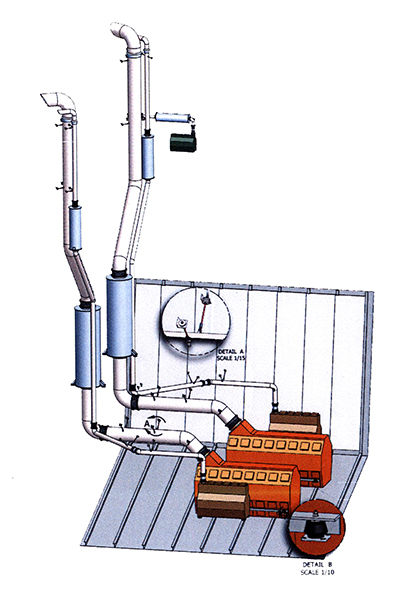 See more about exhaust systems. Improved areas: Entire vessel, with a more noticeable affect in spaces closer to the engine space. Problem: Once you’ve dealt with the intense vibrations caused by your engines, there is still airborne sound coming directly from the machinery, which can travel through the vessel. Overhead Insulation: Fiberglass incombustible hull boards are a basic but appropriate and effective solution. Often we install 4” of insulation – two 2” boards without mass layers, one with a facing and one (the first one applied) without. Best Bet: If you have room, 1 unfaced 2” thick hullboard partnered with a 2” composite with a lead mass layer and a facing will produce the best results. Bulkheads: If they lead to occupied spaces, the bulkheads or hull sides can also be treated, typically with hullboards that do not contain lead mass layers. Applying damping tiles to the forward bulkhead will also help if there are below-deck accommodations forward of the machinery space. Deck: 3/8” or 5/8” damping tiles bonded to the main deck – typically you want to have 70% coverage of the deck – can make a real difference here. Interior Spaces: There are a few best bets to improve noise problems in interior spaces, beyond the traditional solution – sleeping with ear protection. QuietCore and Sylomer are common solutions in the galley, lounge and staterooms, where they can provide valuable insulation to improve privacy between cabins and reduce engine room noise. If you really want to improve habitability, you can also install a floated interior. More.